Here's a picture of me and my soup'd up Float Tube. Hi! My name is Brent Gagermeier. For over a year and a half, I was a disabled, due to an injury to my Back. Funny thing about being disabled, it affects more that just a Back or a Limb... it really messes with a person's mind. It's not long, before a person starts to lose hope. I know that first hand! If that's you too, then keep reading - it gets pretty exciting! I had an accident, at work, that led to a Major Back Surgery. The surgery was not as successful as everyone hoped and for over a year I lived in constant pain. My life revolved around pain-pills, Doctor visits and the usual worries that one has after having their life changed by a disability. One day, I was talking to my Physical Therapist, telling him that the one thing I missed most was not being able to go fishing anymore. He told me that one of his past patients started using a Float Tube to get back into the sport of fishing. I had fished all my life, but had never used a "Float Tube", and didn't know very much about them. So, I began reading everything I could find. I spoke to Tubers and asked lots of questions. When the time came to choose a Float Tube - I knew what I needed and why. Most people thought I was crazy and for good reasons; I had to use a cane to walk - I was taking heavy doses of pain pills and muscle relaxers - I couldn't stand more than 15 minutes or sit for more than 30, but I figured that if there was a chance of this helping me AND allowing me to fish again - it was worth a shot! 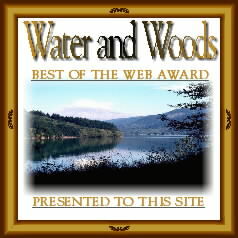 I'm fortunate enough to have a beautiful mountain lake about a mile from my home. So, armed with a rod & reel, some bait and my new Float Tube - I went out on that lake for a few hours, every day. By the end of the first week, a strange thing started to happen - the pain was lessening. By then end of the third week, the pain pills (which I had been taking 8 of each day, for more than a year) were no longer needed. I still had a little pain, but this was due to the muscles in my Back getting a good work out. Since then, I have found that the physical motion used to power a Float Tube is the same that is used in the treatment for Back Patients. 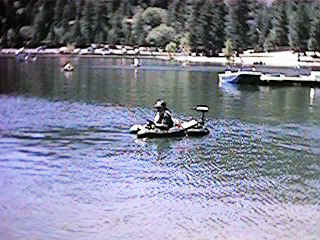 The only difference is that the Float Tube user is able to do something that he or she enjoys, which is fishing and just being outdoors. Most people look at a Float Tube and see a fishing device, but to someone that has had to endure a disability, it becomes a means of freedom. Injuries like these are hard on people. Many lose the hope of ever engaging in activities they once loved, like fishing. This crazy idea of using a Float Tube, is doing so much more than just offering a way to sneak up on that BIG fish - it's helping people! (located in Blue Jay, California). This little guy is called "Dimples". 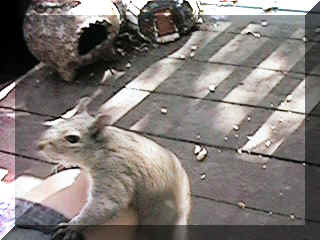 She's a little gray Squirrel, that became my pal while I was recovering from my surgery. Dimples will climb on my lap, even up on my shoulder for a nice, big Peanut. It seems appropriate to include her as part of this Association, because she has a limp also. One of her hind legs looks like it was injured at one time, but she still manages to get around pretty good. There is one thing to remember, when you have little friend like "Dimples"... DON'T WEAR SHORTS! This picture doesn't show the claw marks she left on my leg... OUCH!! !